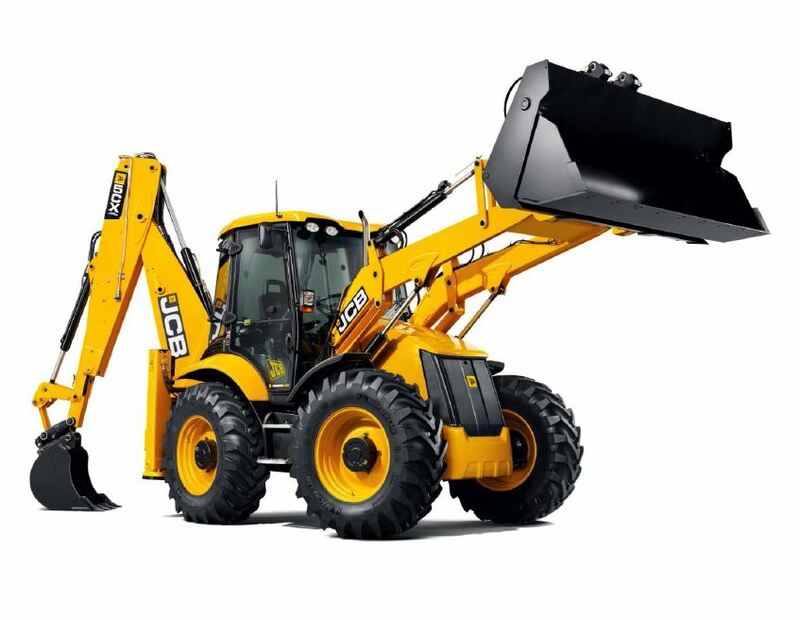 Model of a large JCB backhoe loader. Features 4×4 drive with 3 steering modes, 6 remotely operated pneumatic circuits, cabin with interior, external pneumatic remote, lights and custom stickers. A model 1 year in the making, with some controversial design choices. I had two sources of inspiration for building it: one were Jennifer Clark’s amazing models, including this excavator controlled using an external pneumatic remote. I was looking for an opportunity to control a complex pneumatic model this way, just to see what it’s like. 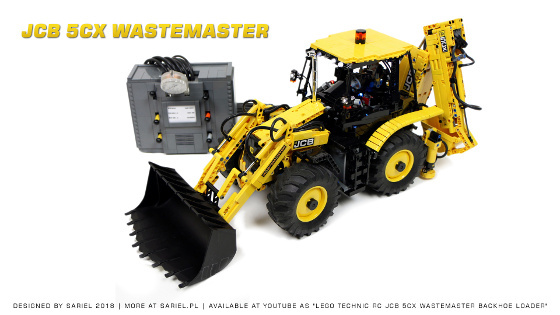 The other source was the LEGO 42054 Claas Xerion set, featuring tires that looked almost exactly like the tires on the real JCB 5CX, except for being slightly wider. Once I scaled the Wastemaster’s blueprint to these tires, I realized there was no way I could have all functions controlled remotely with motors without sacrificing the cabin’s interior – so I decided to control the pneumatics with a remote similar to Jennifer’s, with integrated compressor and battery, which saved lots and lots of space inside the model. Another choice was the mostly Technic exterior. 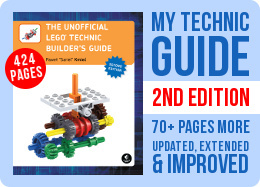 I’m not a fan of LEGO models that look half-Technic, half-System. Personally, I prefer it when these proportions are closer to 90/10 either way. I have decided that with so many functions, so many moving parts and so many pneumatic hoses, I can’t cover most of the JCB’s exterior with System pieces and make it look good, so I went in the opposite direction, choosing to make it look mostly Technic with a few System bits. The resulting model was packed with functions to the brim, building it was a battle for every millimeter of space inside it, mostly because the chassis was fairly narrow and the wheels were using up plenty of space inside it while turning. 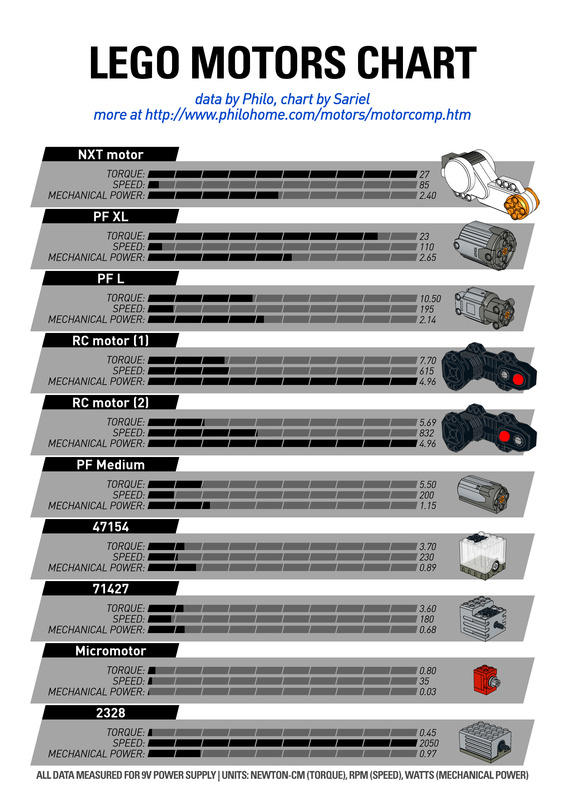 Pretty much all motors and electric elements touched one another, and there was a massive amount of pneumatic hoses and electric wires on top of them. At the center of the chassis were two PF Servo motors with a single PF L stuck vertically between them, driving all wheels. There was no suspension, since I’ve decided that my priority was preserving space for the cabin and the real JCB only has suspension on the rear axle anyway. The rear PF Servo motor was powered through a PF switch operated by a PF M motor with a clutch, allowing to remotely invert the rear axle’s steering, and thus switch between normal four-wheel steering and crab steering. Additionally, the switch was connected to a lever inside the cabin, making it possible to manually turn it off and thus enable front-axle steering only. Another PF M motor was moving the excavator arm at the back from side to side, using an ungainly combination of large linear actuator and chain. It was ugly but it was the only solution that fit in such tight space, and it moved the arm 8 studs from side to center, which was less that the real Wastemater’s range of motion. I specifically wanted to use a linear actuator instead of pneumatics to keep the excavator arm firmly in position, and for the same reason I’ve used another PF M motor with a worm gear to control the excavator arm’s traverse. The traverse was possible thanks to the worm gear sliding on an axle together with the excavator arm’s turntable, and the arm could turn 90 degrees to one side and roughly 40 to the other (all the pneumatic hoses were too tight to let it rotate further). The excavator arm was obviously much too wide – I have initially used a single pneumatic cylinder to raise it, but towards the end of the build the cylinder wasn’t sufficient to handle its full weight, so I’ve added another one. Two cylinders combined were perfectly capable of rising even fully extended arm from horizontal to vertical position. Another pneumatic cylinder, located in the same arm’s section as these two, was raising the arm’s second section, and yet another was tilting the bucket (note that the rear bucket was yellow while real 5CX uses black, because the bucket I wanted to use was only made in yellow). There was also a PF M motor in the excavator’s arm second section, extending it by 4 studs remotely – again, I chose to use a motorized small linear actuator here to keep the arm firmly extended while digging. The front loading arm was moved by two groups of two pneumatic cylinders each, one raising the arm, the other tilting the bucket. I’ve ran into difficulties making it all fit above large front wheels which had front mudguards attached to them and steered together with them, so in order to make the bucket lower all the way to the ground level, I ended up altering the bucket’s mounting a little – it connected to the arm not near its bottom, but close to its top. It still worked properly, but the tilting geometry was slightly different than in the real backhoe. While the model’s motorized functions were operated remotely using two SBricks, the pneumatic functions were all controlled with the permanently connected external remote. The remote was connected to the model with 12 hoses, each 60 cm long. In theory it was possible to disconnect the hoses from the model, hence the row of connectors hanging on the hoses, keeping them aligned to match the model’s pneumatic ports, but in practice it meant losing pressure in all pneumatic systems, so I didn’t bother doing that. The remote housed a compressor with 3 short V2 pneumatic pumps driven by two PF XL motors (as it turned out, weaker motors couldn’t handle loaded pneumatics), six pneumatic valves and an 8878 battery with a switch activated by a spring-loaded trigger. This allowed for a very accurate control, but wasn’t as useful as I hoped it would be, because the pneumatics mostly worked only with very high pressure. Controlling the compressor proved much more essential to controlling the model that operating the valves. I have also included a LEGO manometer for measuring the air pressure at compressor’s output. The remote could have been made significantly smaller if the new pneumatic valves from the 42080 LEGO set were used, but they were too rare and too expensive at that time for me to afford buying six. It was also possible to extend the hoses between the model and the remote, but that was expensive and would probably degrade the pneumatic system’s performance. Finally, the cabin which I cared very much about, housed a Technicfig on a remotely rotated seat, with two instrument panels, and with LEDs and moving steering wheel on the front instrument panel. The LEDs in the panel and the LED beacon on the model’s roof were Brickstuff products, while the cabin’s external lights were regular LEGO LEDs. 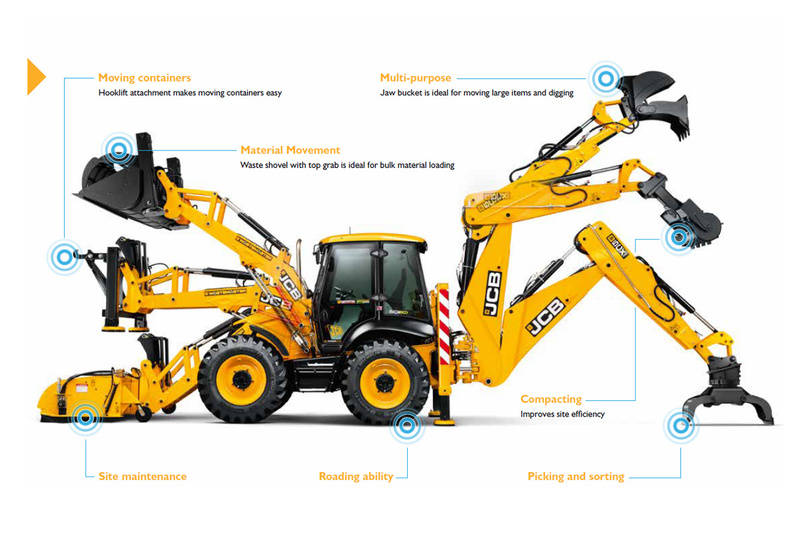 Because the real JCB backhoe loaders look between yellow and orange rather than plain yellow, I have fiddled with model’s color a little. 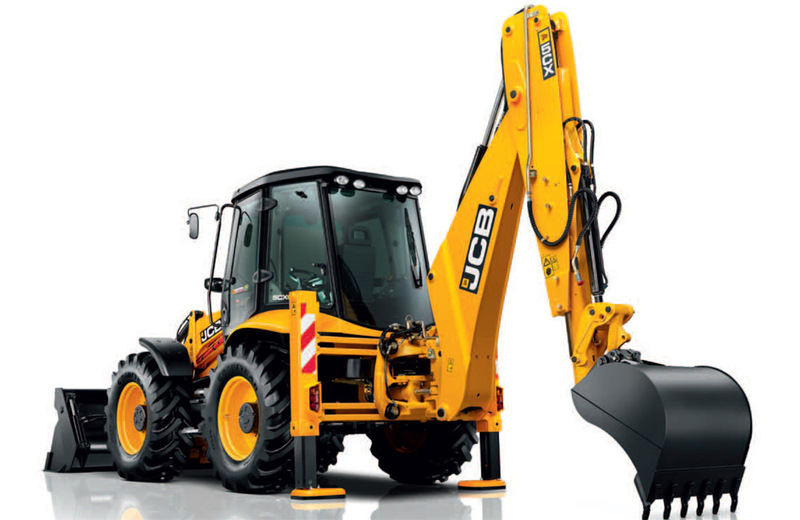 I believe that the closest LEGO color for JCB machines is bright light orange, used e.g. in the 21303 WALL•E set, but it’s a very rare color and it was not possible to build the entire model using it. In the end, I’ve decided to just make the model yellow and alter the color on photos and video a little, which is surely not the best solution, but I preferred it to e.g. painting the LEGO pieces. The model was very challenging to build, with a multitude of functions in a very limited space. I wasn’t entirely happy with it, I think it was somewhat overloaded with functions, there was some flexing in the back, and the pneumatics worked slowly and with limited precision. There is indeed a charm to switching pneumatic valves with your fingers, hearing the air being expelled from the valves and watching the manomenter go up and down, but in practice I don’t think it was noticeable more accurate than controlling the valves remotely e.g. with PF Servo motors, and it was certainly impractical to have the large, unwieldy remote attached to the model at all times. In fact, the longer I played with the model, the stronger I was wishing for linear actuators driven by strong motor, providing immediate response time, without the need to wait for air pressure to build up and without the need to zero a valve to stop some motion. But I guess that’s just how LEGO pneumatics work and there’s no way around it. For all its complexity and overflowing functions, I think the model at least looked nice and well-proportioned. It was my first model using an external pneumatic remote, and most likely the last one, too.